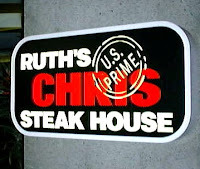 I think that if I could, I would like to eat at least one meal every week at Ruth’s Chris Steak House. Tuesday night I took my friend Mike out for dinner to say thanks for helping me get my new job. We had planned to eat at Legal Seafoods out in Natick, but he pulled a last-minute switcheroo on me and we ended up next door at Metro 9 Steak House, a place I’d never heard of before or even noticed when I’ve driven by. 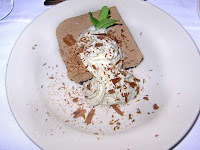 NEWS FLASH: Ruth’s Chris Steak House no longer has the Chocolate Explosion cake on its menu. Apparently, it came off six months ago (and may become a seasonal item). After a pretty excellent birthday meal Saturday night, this had the makings of a disaster. Thankfully, my beloved dessert has been replaced by a chocolate mousse cheesecake that, let me tell you, is so so so so sooooo good. Just seeing the thing practically makes my mouth water (so does writing a blog post about it). 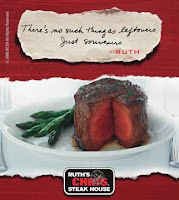 I’ve been to Ruth’s Chris a handful of times (last one was December 2005), and have always loved it. So this year there was only one place I wanted to go with my family to celebrate my birthday. And when my juicy filet mignon arrived in front of me Saturday night, I was practically in heaven.